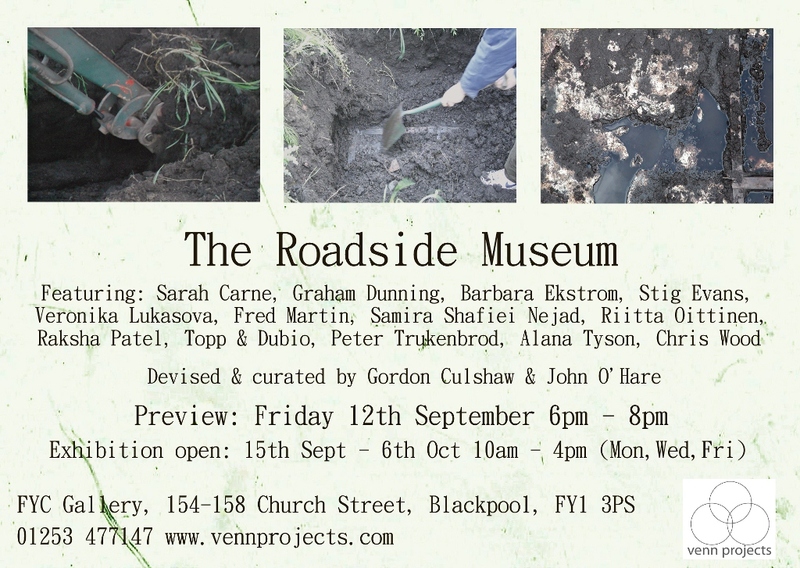 Two of my recordings were buried in summer 2013 and exhumed a few weeks ago for The Roadside Museum, a touring exhibition which will first visit Blackpool. The first of the objects was a specially recorded spool of tape from my Music by the Metre project. As that project references dub music and its mythology, the Roadside Museum offered the opportunity to recreate the story of Lee Scratch Perry burying his master tapes to improve the sound. The second was a dubplate of the Audio Guide from the Visitor Centre project in 2010: the record is a composition made in part from broken shellac pieces dug up from an industrial site in that project. Both pieces will be playable at the Roadside Museum exhibition, in their partially-decayed states. The Roadside Museum is an experimental project examining the feasibility and/or desirability of fast forwarding the ageing process of artists’ work through biological and chemical decay. 13 artists were selected to bury their work on a farm in the north-west of England. Artworks were buried unprotected in a field at a depth of 6 feet. The site was chosen due to its location in a high water table with acidic soil which, it was hoped would accelerate the degradation process. 12 months later, the site was excavated. Artworks were unearthed and, over the summer, the artists were given the time to develop an appropriate way to present their work. This exhibition provides the first chance to see the resulting work. The project provides the opportunity for a range of media to be considered in relation to the progression of time and decomposition, whilst providing unique documentation of the West Lancashire region. It has been conceived as an experimental ‘art’ residency due to the predicted physical transformation of the objects which reside on the farm for 12 months and how the artists/viewers engage with and respond to this change. Artists: Sarah Carne, Graham Dunning, Barbara Ekström, Stig Evans, Veronika Lukasova, Fred Martin, Samira Shafiei Nejad, Riitta Oittinen, Raksha Patel, Topp & Dubio, Peter Trukenbrod, Alana Tyson, and Chris Wood.